Category: Feature Greenhouses On Sale, Free Standing Greenhouses, Pacific Series, Pacific Series - On Sale, Sun Garden Greenhouse Kits, Twin Wall Polycarbonate Greenhousese, Under $2,000, More.. The Sun Garden hobby greenhouse kit is on sale everyday! This twin wall polycarbonate greenhouse measures approximately 8'3" wide x 8'4" long. The Sun Garden greenhouse has appealing curved eaves. This quality greenhouse makes an architectural delight. The 6mm double Twin Wall polycarbonate efficiently traps heat that is produced by the sun insulating it against the cold. The light transmission is 85%, and sunlight is diffused allowing even more growing! Polycarbonate also minimizes against interior condensation. The Sun Garden hobby greenhouse kit is built to withstand harsh weather conditions, the durable aluminum frame comes with an attractive white, green or brown enamel paint finish. It includes one large automatic solar powered roof vent that measures 20" x 48" to provide air circulation. This polycarbonate hobby greenhouse kit also includes a standard storm lockable door with an adjustable sliding screened glass panel that will increase ventilation within the greenhouse. The greenhouse door is hinged on the left. We all know there are several greenhouse products on the market today, and no other greenhouse has been designed to carry this much weight! 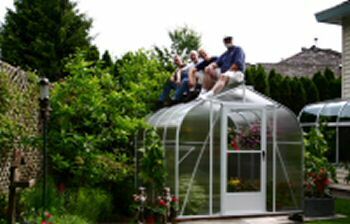 Ask yourself how many years you want to use your greenhouse. If you want a quality greenhouse that is built to last, then this is the greenhouse for you. You won't have to worry about this greenhouse blowing away or collapsing under the weight of hanging baskets! It has been designed and constructed by a manufacturer who has met the highest engineering standards for over 50 years! Our trained, knowledgeable and technical staff is always available to answer our customer's questions.